Reliability, quality and innovative technologies – all these determine architectural solutions of Aquamarine residential estate. The design for the skyscraper has been developed by highly qualified specialists from Hong Kong considering its special location, landscape-unique height of the building, as well as requirements to elite class dwelling. The best engineering solutions are used at every stage of construction. The building architecture is represented in simple and elegant style using environmentally safe materials. Interior spaces appear light and comfortable due to the translucent façade structures of the skyscraper. “Aquamarine” will be a new decoration of Vladivostok city scenery with its laconic building exterior. Building the first skyscraper among hills at the seaside is a challenging task that requires special approach to everything, particularly choosing durable materials. 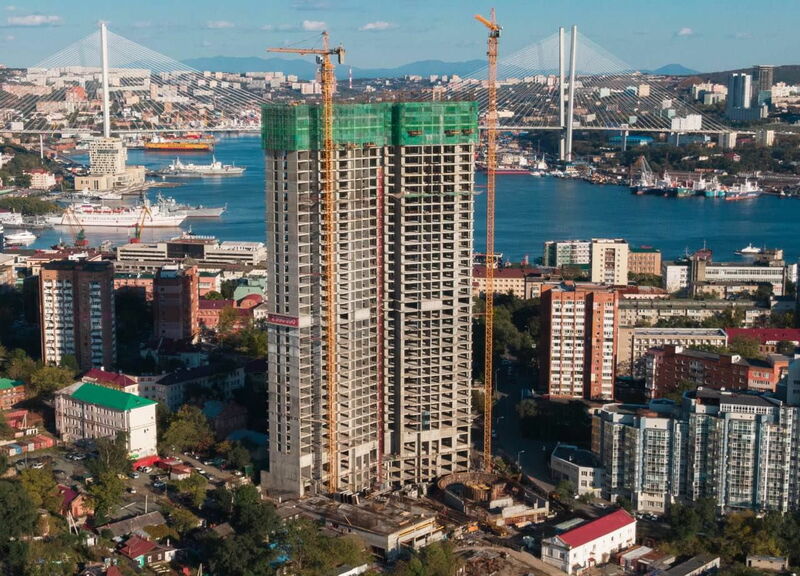 We have achieved our goal: solid-cast body of the building with high seismic resistance is made of high-strength class В35 concrete, that is used only for long-life structures with special requirements to strength — bridges and hydraulic facilities, bank vaults and subway tunnels. Steel reinforcement using compound toughened class А3 steel. The cast reinforced concrete slab building base 2500 mm thick is made on bored piles over 40 meters long. Thickness of cast-in-place frame bearing walls — 300-400 mm, thickness of intermediate floors — 250 mm. The facade of Aquamarine residential estate is a result of synergy of high technologies and design which is exclusive to Russia, that is one-and-only model. The skyscraper appearance acquires lightness and esthetics being unusual for its monumentality, and becomes the new symbol of Vladivostok. 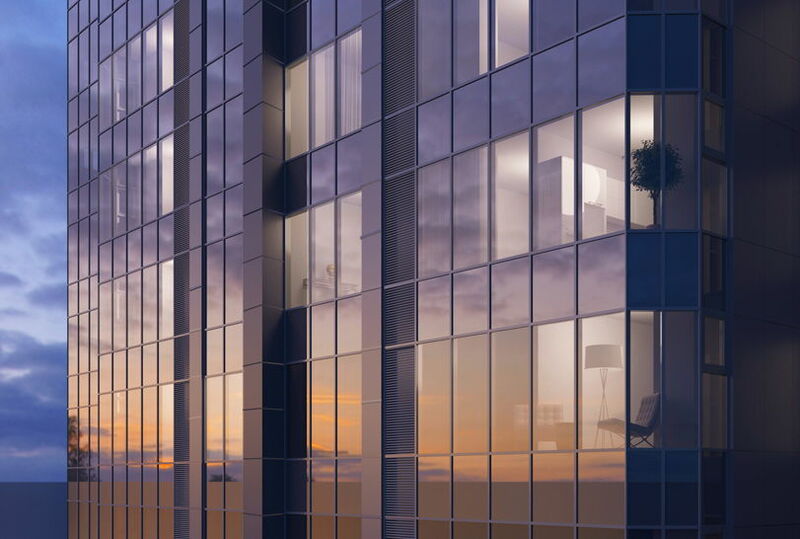 Guardian translucent structures have a high level of energy efficiency and enable to maintain a comfortable micro-climate in the skyscraper apartments all year round. Silver coating of multi-functional glass protects the apartment against heat loss, and sun-screen cover protects it against overheating. German facade system company Schüco is a leader of innovative solutions in their respective field, which profiles ensure high fire- and freeze resistance. Plenty of ambient light in every room due to floor-to-ceiling glazing favorably influences upon health and makes living in the skyscraper very pleasant. Outer coating is made of metallic panels with non-combustible mineral warmth-keeping plates. The building drainage system is built in reinforced water proofing cover, it removes excess moisture from under sewage pipes, this enables maintenance of a pleasant and clean environment. The whole structure is covered with granite slabs for protection against mechanical damages. Reaching the roof within 30 seconds, at a height where the hustle and bustle of the city become tiny and the sky is near at hand, feeling only comfort and calm. 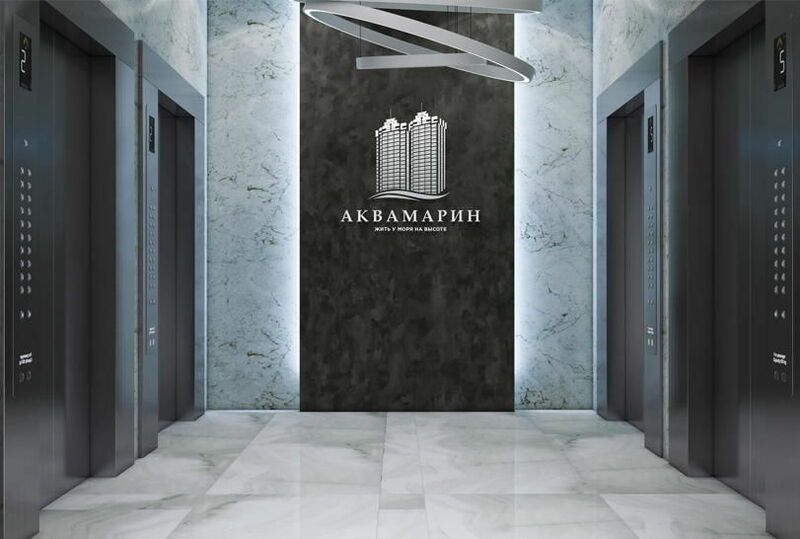 All the things are possible now in Aquamarine residential estate due to high-speed and noiseless elevators installed in the skyscraper, from the leader of the global lifting equipment market — Thyssenkrupp Elevators. They won’t keep you waiting: unified smart system of landing call in every block section and elevating speed make the process to be the most convenient for residents. The structure itself has pressure drop control, so this trip will not affect your well-being, it will rather remain unnoticed. “Unic”series elevators are equipped with up-to-date drive which ensuresuncompromising performance and movement speed of 4,5 m/s, this is 1,5 floor per1 second, lifting capacity of 1600 kg, and special operation mode in case ofemergency situation. Fresh air and healthy micro-climate in every apartment are our viewpoint but not just bare words. 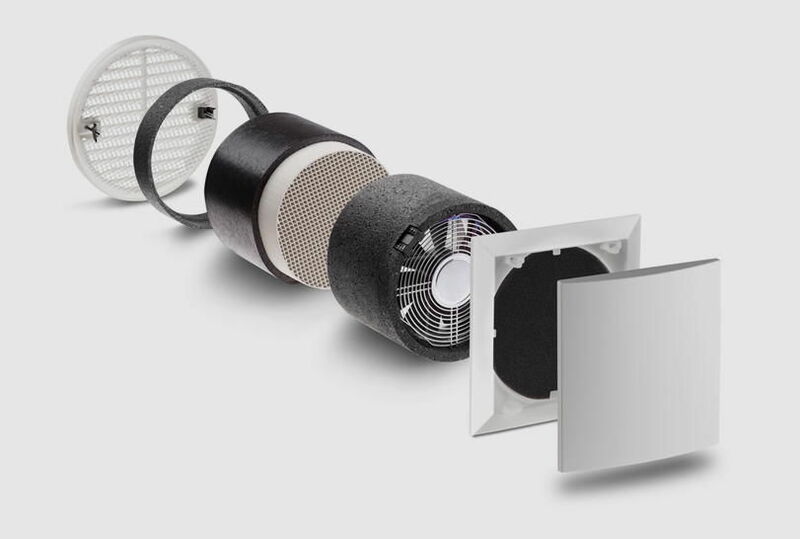 We have chosen new-generation inflow exhaust ventilation systems Geniox Comfort (Systemair) with an air recuperation function. It will remove dust and dirt from the air by a fine purification system before your inhale, will moisturize the air and fill it with life. You can forget about air conditioners, ventilation is made according to chiller-fancoil technology which maintains the set temperature level and brings fresh and comfortable air to your home. All communication systems in the residential estate operate to ensure maximum comfort for residents and are intended to be efficient and invisible. 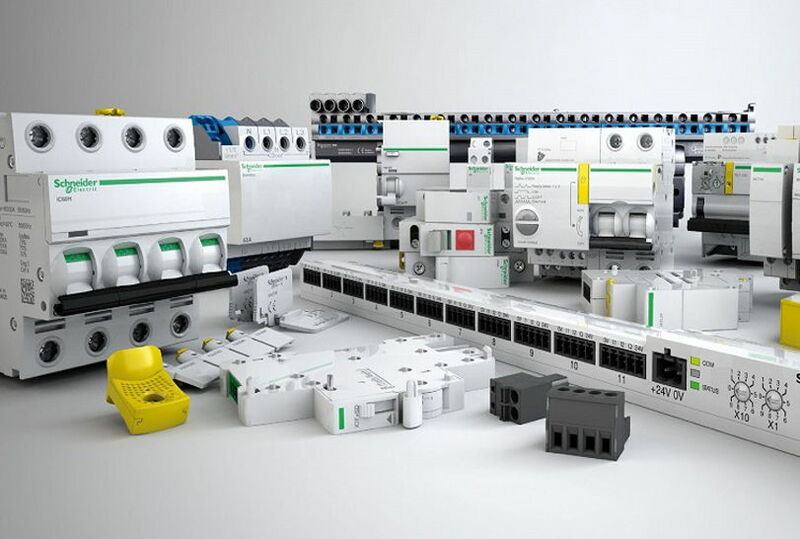 That is why we have chosen electrical equipment from Schneider Electric having a nearly two hundred year history. It reliably protects the network against overload, and automatic devices enable you to save energy. Common areas are equipped with up-to-date lighting fixtures from globally recognized manufacturer Philips. In the underground parking place, they are equipped with motion sensors for convenience of drivers and energy savings. To ensure the uninterrupted operation of all systems in case of emergency situations, an emergency power supply is provided, Volvo diesel generator with a capacity of 956 kW. Water supply in the skyscraper is centralized and operates through the upper supply system, thereby water pressure will be unchanged at any time and on any floor. The building is fitted with elastic cross-linked polyethylene pipes which are capable of withholding wide temperature variations. Water is exposed to primary treatment and filtration without fail. 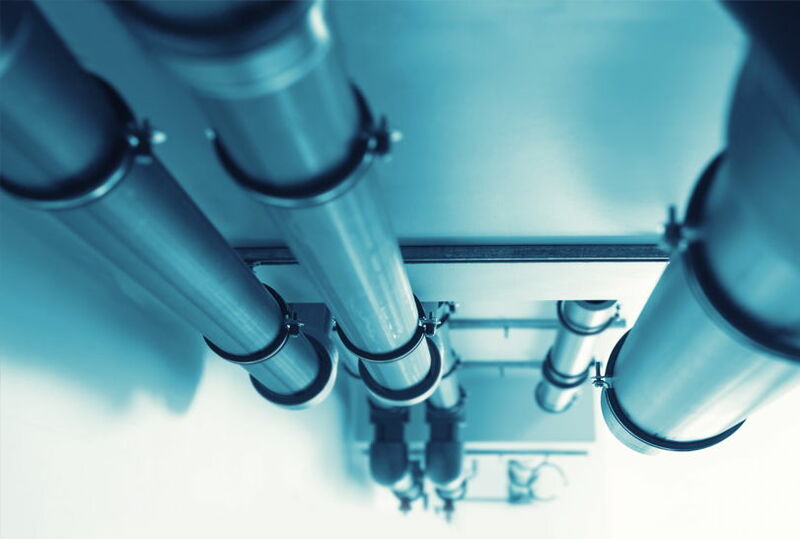 Heat supply in the residential estate is arranged through central systems a connection to which is carried out through an individual heating unit assembled from AlfaLaval heat exchangers and Grundfos pumps. In addition, all life-support systems of the building are placed on the unified control point for constant monitoring. Individual resource counting devices are arranged out of the apartments which enables not to disturb the residents when taking readings. When living in Aquamarine, there is no need to think of living conditions, we will arrange everything for you.